In a slight diversion from the usual food and drink based-shenanigans. I'm taking a time out to take Pies and Fries on location. Most avid readers of the blog (hi again, Mum and Mrs P) will no doubt be aware of my unabashed Bond love. 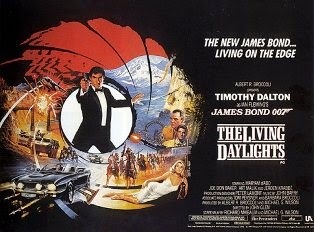 It’s true I’m a massive 007 fan and my favourite film of the franchise – possibly... probably... if I really, really had to choose – is 1987's the Living Daylights. Yes, that’s right not the classic Connery, jocular Moore or ice cold Craig, but the wonderful, and very overlooked, Timothy Dalton making his debut in a first of a deuce of appearances as the world’s most famous spy. A fabulous film that, for various reasons, failed to jump start a flagging franchise and lead to the slightly less lovable Licence to Kill. Now normally I’m not really a fan boy about such things, but rather excitingly – and, you can imagine, this really thrilled the Ewing -we recently had the chance to visit some of the locations in TLD; firstly in Vienna and then closer to home in London and the Chilterns. Our first port of call was the Volksoper in Vienna which provided the façade of the 'Ľudové Konzervatorium' (people’s conservatory) in Bratislavia (still a Communist country, an not open to filming, when the TLD was shot), the backdrop to some of the most iconic scenes from the film. While the building itself looks pretty much the same - save for the large red lettering on the left hand side of the building - the most striking thing is how much the scrawny little sapling that you see planted at the front of the building in the film has grown in the last 26 years! I took my pictures of the Volksoper’s exterior from outside the sweet shop on the opposite side of the street. It’s the same shop that Bond and Saunders access in the film in order to try and get a clean shot at Kara Milovoy, Koskov’s supposed assassin, who appears in the top window above the balcony of the Volksoper during the interval. It was closing when we arrive, but pictures of Timothy Dalton can apparently still be seen stuck up inside. While the interior shots of the Ľudové Konzervatorium were provided by the Sofiensäle (sadly burnt to a shell in 2001) in the film, we were lucky enough to have a night in the gods at the Volksoper. Our evening's entertainment was provided by Strauss' Die Fledermaus, a farcical operatta first premiered in Vienna 137 years before, and still able to raise a laugh, especially after a few cans of Ottakringer drunk en route. Some of the best scenes from any Bond film are to be found in TLD, where Koskov is sprung from Blayden, the MI6 safe house deep in the English countryside. 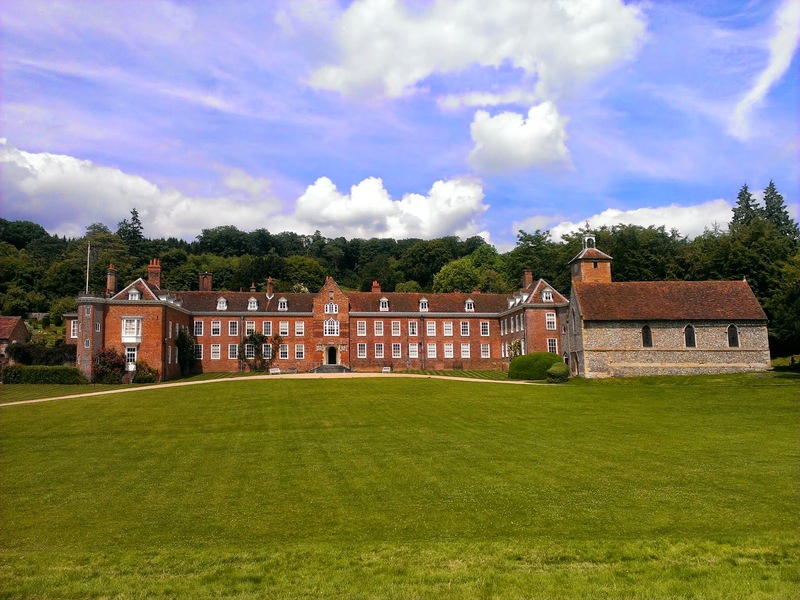 In real life the exterior shots of Blayden and its surrounds are provided by Stonor Park, just outside Henley, with the interior being filmed back in the studio. Built in c.1180, Stonor House has been the home of the Stonor family for more than eight centuries and is still privately owned, and lived in, by the family. Both the house and gardens, with a small shop and tea room, can be visited between 1-5 on Sunday and Bank Holiday Mondays, so we jumped in the jalopy one sunny Sunday afternoon for a gander. In Stor's scenes, Necros, undoubtedly one of the franchise’s most fearless henchmen, hijacks the local milkman’s float – one of the only things that really dates this classic film – before driving to the safe house and attacking the staff with various weapons including electric carving knives, handfuls of salt, a set of saucepans and the lead his Walkman headphones (another great 80’s touch). This leads to the double agent Koskov being re-captured by the rebels, who arrive on the front lawn in an ambulance helicopter, assisted by Necros who is now disguised as a doctor. Only the grounds front of the house and chapel are visible in these scenes, which means that sadly you don’t get to see the beautiful English garden, with stunning views across the Chiltern Hills and to the deer park and woodland behind. While they don't make the film, the Italianate style gardens are charming, shouldn’t be missed. As well as the neat as a pin lawn just to the back of the house there is a maze of meadow and orchard gardens that mix neatly topiaried rows of trees with wild grass. The long mixed border at the top of the terrace, complete with giant artichokes and glorious climbing roses, ends with a Japanese garden house, built after the 5th Lord Camoys visit to Kyoto at the turn of the last century. Bond also explains to M that he took the liberty of changing it as the champagne as the brand on the list was “questionable”. As mentioned above, these interior shots were not set in Stonor, but we did get to see some of the interior for ourselves when we stopped by the tea room that is housed in the fabulous Old Great Hall. A fabulous room complete with its old deer skulls on the walls, trophies from the deer park behind the house, and new glass atrium. 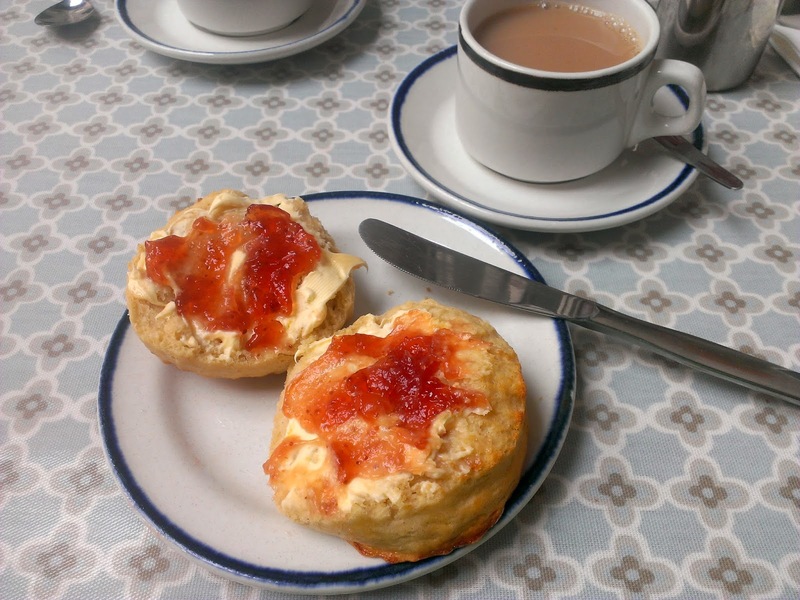 The cream tea comes highly recommended,; generous pots of tea and giant, freshly baked scones, although the portions of cream and jam were a little lacking. There’s also a range of homemade cakes and sandwiches available to eat in or out. Slightly confusingly, after the scenes set in Bratislava that were filmed in Vienna, we then move on to the scenes set in Vienna that were also filmed in the city. After a great snowy chase that sees Bond and Kara crossing the Austrian/Slovakian border on a cello case they arrive, even more ingloriously, in Vienna on the back of a vegetable truck. On their disembarking you can see the Reisenrad in the background, as well as, very briefly, the Shell petrol station, which stills stands, unchanged, by the entrance. The Reisenrad, situated in the Prater Park, is one of Vienna’s most iconic landmarks, and Bond and Kara return to the Prater later that evening for a bit of schmoozing for Bond to rendezvous with Saunders. But not before they take a fiaker, traditional Viennese horse drawn carriage, to the Schonnbrunn Palace. 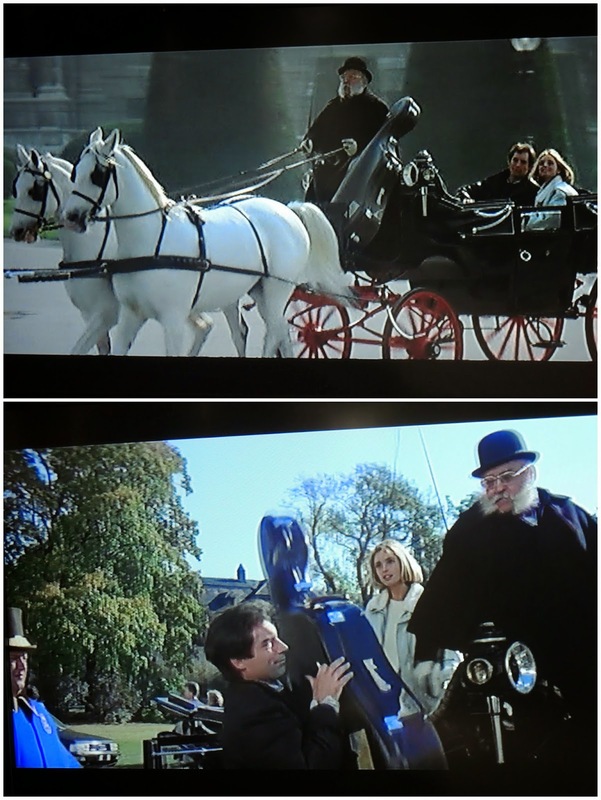 Bond is surprisingly gallant in these scenes, gazing lovingly at Kara in the carriage and then even insisting on separate rooms when they arrive at the hotel Palais Schwarzenberg. The film was made middle of the AIDS epidemic, and Bond’s usual philandering was kept in check, although he does smoke in the film, something which is now probably frowned upon more than promiscuity. I wish I could describe our trip to the Schonbrunn quite as romantically as Bond’s, but it was hot, I was hungry and we had to climb the hill to the top of the Gloritte before we could eat our picnic. That said, once our pretzel rolls, schinken and Kase were dispatched, we could finally relax on the lawn and enjoy the glorious views over the city and things didn’t seem so bad after all. The interior was similarly stunning and a mercifully brief audio guide means you can get a good over view of some of the 1,441 rooms without losing the will to live while looking at another four poster bed or antique dinner service. There’s also very good strudel available from the adjacent Café Residenz. 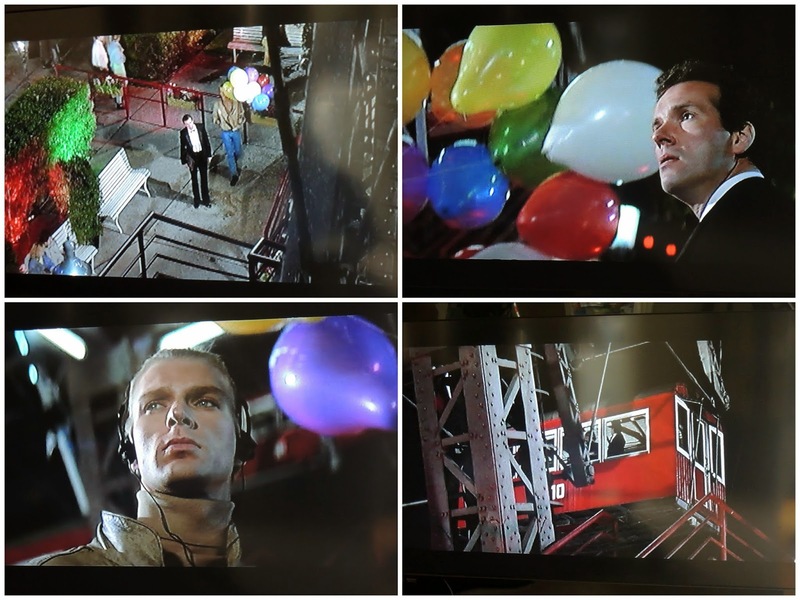 On Bond and Kara returning to the Prater that evening, we see some of the most exciting and touching scenes in the film. After the obligatory ride on the waltzers and triumph on the shooting range the loved up pair take a spin on the big wheel. From his vantage point Bond spots a balloon seller, aka Necros, offering Saunders his wares. His line, Balloon, Mein Herr?, is a direct reference to the Third Man, the most famous of all films shot in Vienna, and is well worth a watch if you haven’t seen it already. After a bit of seduction high in the sky, Bond leaves Kara briefly to meet Saunders at the Prater café -I’m not sure if it’s still here or not, as we didn’t get a chance to explore much beyond the wheel, but from his expression James doesn’t rate the coffee too highly anyway. Here we see Saunders hand over the info to Bond before being trapped between the remote controlled sliding doors as he exits (the rigged hydraulic piston can just be glimpsed in the far right of the shot). Of course, if Necros was really clever, he would have dispatched Saunders before the rendezvous with Bond, but anyway I digress… What is really touching about this scene is seeing Dalton convey Bond’s softer side. Although Saunders is a stuffy bureaucrat at odds with Bonds lazzies fare attitude, during the film they develop an understanding and James is genuinely stricken by the fact he was unable to protect him. Our ride was far less eventful, but still no less enjoyable, and the views from the wheel on a clear day are not to be missed. The rest of the park itself is a pleasantly old fashioned sort of place with the usual selection of fairground rides and games, although, as there’s no entrance fee to the park, it’s easy just to take the Metro to the Prater just for a spin on the wheel, as we did. The park scenes mark the end of the European locations, until the final act when Bond returns to watch Kara in concert. In between, of the more far flung locale they visit, Tangier is high on the list for a potential next adventure, although remote Afghanistan, where bond joins the Mujahideen to try and bust Whittaker’s opium ring, is probably not going to be on the itinerary anytime soon. Their internment in Central Asia does, however, lead to one of the film’s funniest lines: Kara: "You were fantastic – we're free!" Bond: "Kara, we're inside a Russian air base in the middle of Afghanistan." The film ends with the credits rolling over a night time view of the Schonbrunn Palace, accompanied by another criminally overlooked nugget, the Pretenders ‘If There Was a Man’; the first time a Bond film has featured a different track for both opening and closing credits. Linda: [into phone] It's all so boring here, Margo - there's nothing but playboys and tennis pros. [sighs] If only I could find a real man. Bond: I need to use your phone [takes phone] She'll call you back [hangs up]. Bond: Bond, James Bond [into phone] Exercise Control, 007 here. I'll report in an hour. Linda: [offering drink] won’t you join me? Bond: [into phone] better make that two.